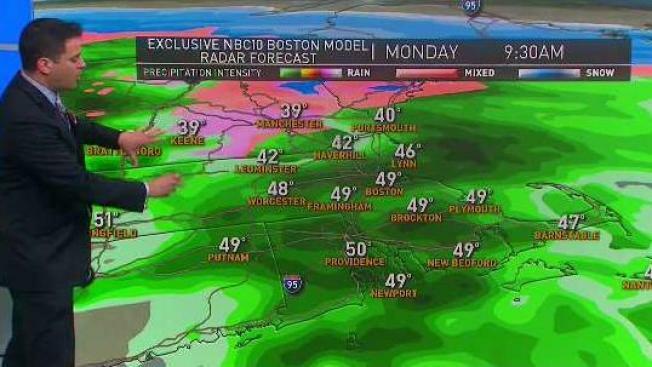 Keep your umbrella and hooded jackets handy because rain will fall in central and southern New England on Monday. In far northern New England, from the White Mountains into the crown of Maine, significant snow is likely. Snowfall totals may even approach a foot in spots. Tuesday will be unsettled. It’s the home opener at Fenway and temperatures will only be in the low 50s. It’s possible that a few snowflakes could mix in Tuesday evening away from the coast. Our weather does start to improve by Wednesday afternoon. Thursday should be the pick of the week with sunny skies and temperatures in the low 50s. Another round of unsettled weather is possible to close out the work week. Showers will be around Friday. The weekend looks mostly dry, but we can’t rule out a few remaining showers. Unfortunately, rain chances increase once again going into Marathon Monday. It’s still a week away and the forecast will likely change a bit, but the current thinking is that it will be rainy and raw. On Tuesday and Wednesday of the following week, the sun should return with temperatures holding in the low 50s.